Throughout history, people have dyed their textiles using familiar, locally available materials and archaeologists have discovered evidence of textile dyeing dating as far back as the Neolithic period. Plants, invertebrates and minerals are all sources of natural dyes with the majority derived from plant sources such as roots, berries, bark, leaves, lichen and fungi. There are a vast number of plants from which you can obtain dye. I have always presumed that most of them would produce decidedly earthy colours compared to the bright synthetic dyes we take for granted in modern life. I could not have been more wrong. Please note that not all lichens produce a dye so please do your research before you forage for them. Many grow exceptionally slowly, so it is essential to gather responsibly to avoid damaging colonies. We currently have two lichen dye projects on the go. Also known as Cudbear, this lichen was traditionally used in the Highlands of Scotland to produce a vivid purple dye. Growing almost exclusively in the far North of Scotland, the sample I used I purchased from a lovely lady at the Wilderness Gathering who is an expert on Natural Dyeing. 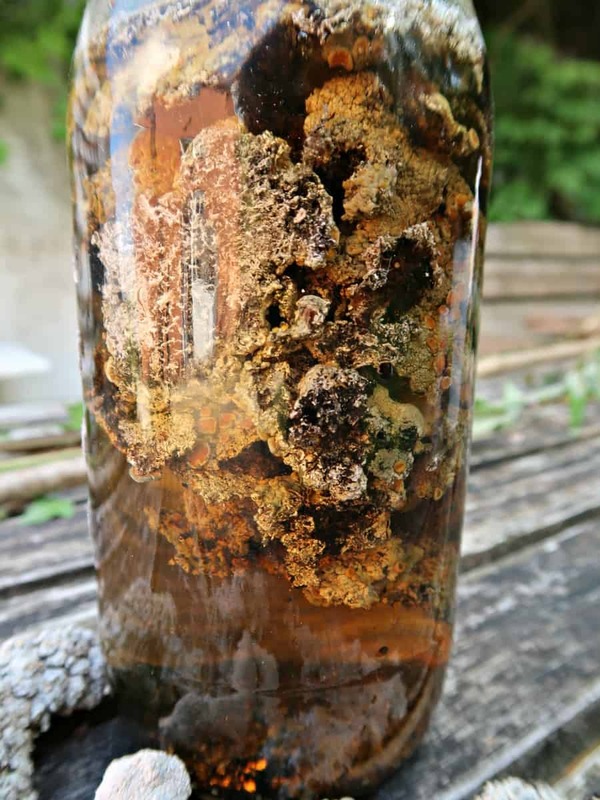 This lichen needs to be fermented in an ammonia solution to extract the intense colour which can range from bright pinks and purples to maroon. More commonly known as Oakmoss this widespread lichen is found growing throughout the northern hemisphere. Used extensively in perfume production it can often be found on the ground beneath oak trees making it an easy lichen to gather. I collected the jar full that I’ve used in the dye below from the ground during my dog walks. I typically find a couple of pieces each day. Utilizing the ammonia method outlined below it yields a lilac/purple dye, alternatively, a yellow colour can be prepared by just boiling the Oakmoss in water. 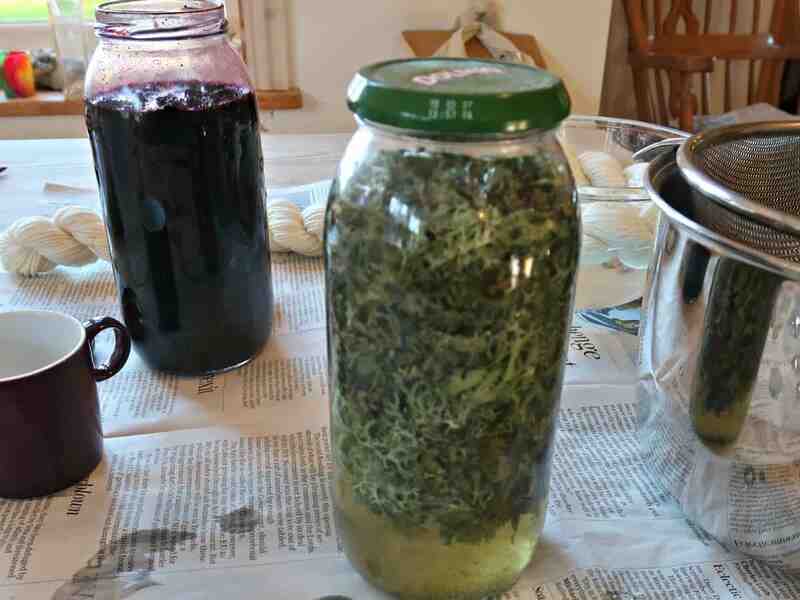 Half fill a glass jar with the lichen. Add a mixture of one part ammonia to two parts water. Oxygen is required for the chemical reaction to take place, so the advice is to fill the jar three-quarters full with the solution and to remove the lid to replenish the oxygen every so often. Keep the jar in a warm place and shake vigorously each day. The dye should be left to ferment for at least three months to achieve an intense dye colour. Pour half of the lichen dye liquid through a strainer into a saucepan. 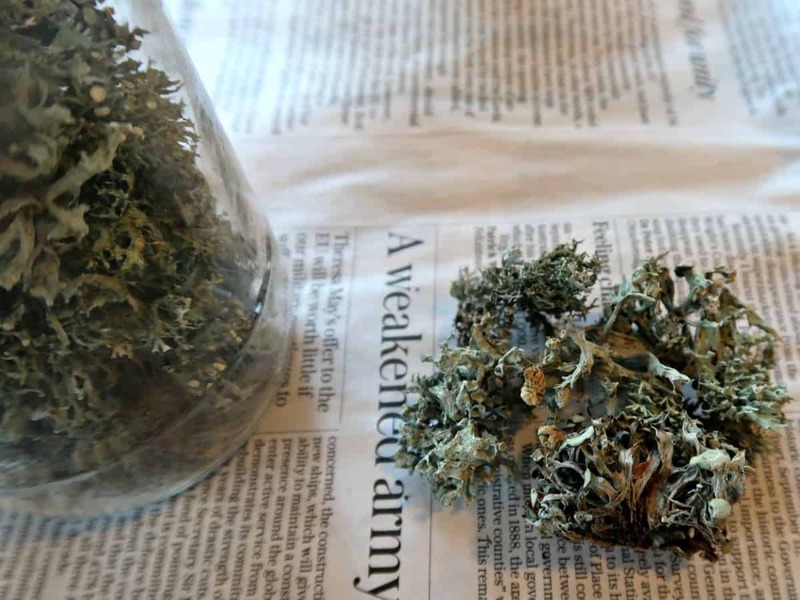 Return the strained lichens to the jar and top up with a new ammonia/water mix – you should get another couple of batches before you lichen is ‘spent’. Add water to your dye pot and submerge the material you are dyeing (having prepared it by soaking in water first). Bring to the boil and simmer gently for about an hour or until you achieve the colour you want. Remove your dyed product and leave to dry. A new wet item can be added to the pot once the dye has cooled and the process repeated. Each subsequent dye will be lighter as the dye pot becomes exhausted resulting in a colour variation. Our photos show this in the three darkest skeins. The lighter ones were achieved by popping the wool skeins in the bath for a minute or two before removing them. The dye we used for all the skeins, and the unspun fleece came from the Ochrolechia Tartarea lichen. The Evernia Prunastri is still steeping, and we will share our results from that in a future post. Lichen dye does not need a mordant. The colour will fix and should not fade. 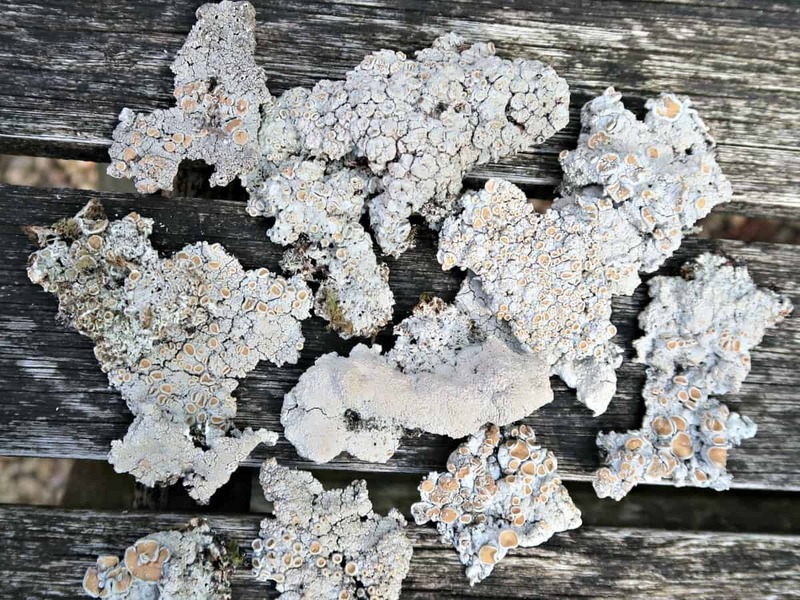 Some lichen dyes are photo-sensitive so the dyed item will change colour when exposed to intense sunlight. I hope to experiment with one of these lichens soon. For more traditional nature craft inspiration check out our How to Make Oak Gall Ink and our How to Make Pine Resin Salve Posts. I will Sarah. We had some rough weather last night and we managed to walk our whippet earlier. I picked a bread bag full of lichen off windfall branches. Isn’t vinegar a mordant in some cases? Hi, glad I found your page, I have some Cudbear, which I also got from the Wilderness Gathering. I haven’t started it yet as I was unsure when’s it said an ammonia liquid. Can I ask what you use and where you get it? Thanks for posting about this. I THINK I have a tree with the oakmoss lichen growing on it. Bits keep falling off. I often used to save bits but had no idea you could dye with them. I’ve been dyeing with Alum, iron and vinegar and trying every plant left in my garden, leaves are falling fast from trees though. Can I get prints from leaves with using lichen to dye with instead of fruit teas and alum, iron and vinegar? Might be next year before I’ve collected enough lichen though. Your colors are amazing! I am on vacation and just collected some moss to try dyeing some yarn. I won’t be home for a couple of days. How do you recommend me keeping it till I get home? Right now it’s in plastic zip lock bags. Hi Sarah. I am a research scholor interested in lichen dyes and its fastness properties. Can we have a personal discussion about this. Hi Sarah, do you just simmer the wool without stirring – I’m worried that my wool will felt otherwise. 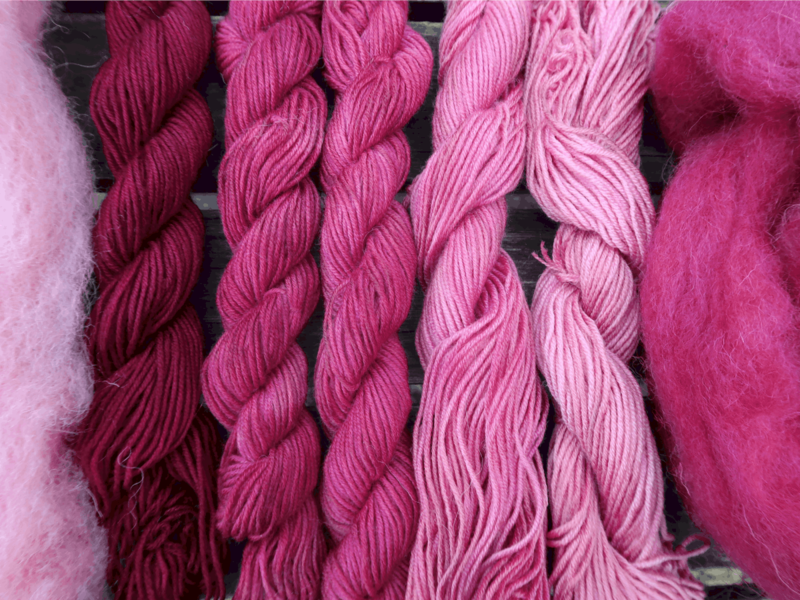 Would you recommend dying the wool in the raw state or skeins -which produced the most consistent colour? Fabulous post by the way, I’m inspired! 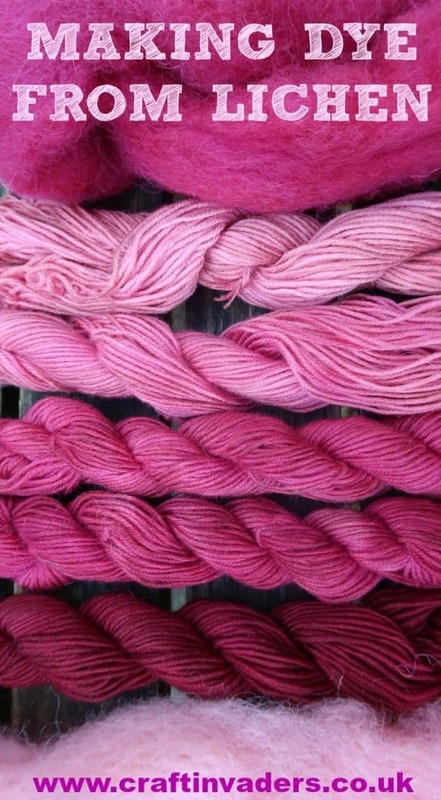 Would love to see more posts on natural dyes. It took at least 2 or 3 weeks for them to look more like dye and less like pond water. I was a bit rubbish at remembering to take the lids off to let oxygen in but I did think that they started to change a day or so after I did that on one occasion. The sweetcorn sounds gorgeous – please do let me know how it works out! This is so cool! One would never have thought that something that color could produces such a pretty colored dye. What’s a “mordant”? This is such fascinating info! I’m so totally surprised that those rather blah-looking lichens produce such vibrant colors! Berries yielding dye I can understand, but lichens! Fascinating! What color were the skeins to start with? Is this what is meant by “organic” yarns? You always do the coolest projects! I knew that you make dyes from plants, but I had no idea that you could get such beautiful colors! 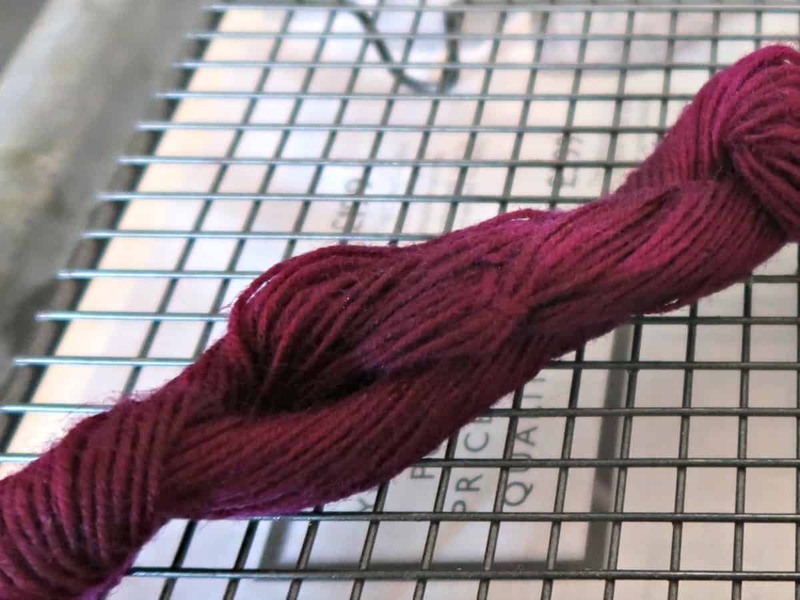 Thanks Jess, it is a beautiful colour – I’ve definitely got the natural dye bug now !